A cuticle /ˈkjuːtɪkəl/, or cuticula, is any of a variety of tough but flexible, non-mineral outer coverings of an organism, or parts of an organism, that provide protection. Various types of "cuticle" are non-homologous, differing in their origin, structure, function, and chemical composition. Anatomy of the basic parts of a human nail. 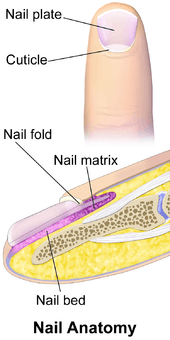 In human anatomy, cuticle (sometimes confused with eponychium) refers to several structures. It refers to the layers of epidermal cells or keratinocytes that produce the horn protein keratin, and also to the superficial layer of overlapping cells covering the hair shaft (cuticula pili) that locks the hair into its follicle (See also Cuticle (hair)). In zoology, the invertebrate cuticle or cuticula is a multi-layered structure outside the epidermis of many invertebrates, notably roundworms and arthropods, in which it forms an exoskeleton (see arthropod exoskeleton). The main structural components of the nematode cuticle are proteins, highly cross-linked collagens and specialised insoluble proteins known as "cuticlins", together with glycoproteins and lipids. The main structural component of arthropod cuticle is chitin, a polysaccharide composed of N-acetylglucosamine units, together with proteins, lipids, and catecholamines The proteins and chitin are cross-linked by catecholamines such as N-acetyldopamine, contributing to their rigidity. The rigidity is a function of the types of proteins and the quantity of chitin and catecholamines. The more acidic the protein is, the softer the cuticle. It is believed that the epidermal cells and hemocytes (cells in the hemolymph) produce protein and also monitors the timing and amount of protein to be incorporated into the cuticle. Often, in the cuticle of arthropods, structural coloration-producing nanostructures are observed. Epicuticular wax covering the cuticle of a leaf of Hosta sieboldiana makes it hydrophobic. Water, unable to wet the cuticle, beads up and runs off, carrying dust and soluble contamination with it. This self-cleaning property is variously called "ultrahydrophobicity" or "ultralyophobicity" in technical journals. More popularly it is known as the Lotus effect. In botany, plant cuticles are protective, hydrophobic, waxy coverings produced by the epidermal cells of leaves, young shoots and all other aerial plant organs. Cuticles minimize water loss and effectively reduce pathogen entry due to their waxy secretion. The main structural components of plant cuticles are the unique polymers cutin and/or cutan, impregnated with wax. The cuticles of plants function as permeability barriers for water and water-soluble materials. The cuticle both prevents plant surfaces from becoming wet and helps to prevent plants from drying out. Xerophytic plants such as cactus have very thick cuticles to help them survive in their arid climates. Plants that live in range of sea's spray also may have thicker cuticles that protect them from the toxic effects of salt. Some plants, particularly those adapted to life in damp or aquatic environments, have an extreme resistance to wetting. A well-known example is the Sacred Lotus. This adaptation is not purely the physical and chemical effect of a waxy coating, however; it depends largely on the microscopic shape of the surface. When a hydrophobic surface is sculpted into microscopic, regular, elevated areas, sometimes in fractal patterns, too high and too closely spaced for the surface tension of the liquid to permit any flow into the space between the plateaus, then the area of contact between liquid and solid surfaces may be reduced to less than a tenth of what a continuous surface might permit. The effect is to reduce wetting of the surface substantially. "Cuticle" is one term used for the outer layer of tissue of a mushroom's basidiocarp, or "fruit body". The alternative term "pileipellis", Latin for "skin" of a "cap" (meaning "mushroom") might be technically preferable, but is perhaps too cumbersome for popular use. It is the part removed in "peeling" mushrooms. On the other hand, some morphological terminology in mycology makes finer distinctions, such as described in the article on the "pileipellis". Be that as it may, the pileipellis (or "peel") is distinct from the trama, the inner fleshy tissue of a mushroom or similar fruiting body, and also from the spore-bearing tissue layer, the hymenium. Wikimedia Commons has media related to Cuticle. ↑ Quere, D.; Surface chemistry. Fakir droplets, Nature Materials 2002, 1, 14. ↑ Vignolini, Silvia; Paula J. Rudall; Alice V. Rowland; Alison Reed; Edwige Moyroud; Robert B. Faden; Jeremy J. Baumberg; Beverley J. Glover; Ullrich Steiner (September 10, 2012). "Pointillist structural color in Pollia fruit". Retrieved 11 September 2012. ↑ Jaeger, Edmund C. (1959). A source-book of biological names and terms. Springfield, Ill: Thomas. ISBN 0-398-06179-3.